The Toltec Site is a National Historic Landmark, the first Archeological State Park in Arkansas, and the setting of a 41-year partnership between the Arkansas Archeological Survey and Arkansas State Parks. Located on an abandoned channel of the Arkansas River near Little Rock, the site first came to national attention nearly 140 years ago when Edward Palmer of the Smithsonian Institution Bureau of Ethnology described his visit to the site in the Smithsonian’s landmark report on Mound Exploration published in 1894. Early excavations at Toltec Mounds. Dr. Martha Rolingson is pictured on the left. Toltec was remarkable even at that early date for its 18 mounds, the largest being 15 meters tall, and the surrounding embankment and pond that enclosed 42 hectares. Over the next century, visitors to the site also took note of the unusual kinds of artifacts found in the fields on and around the mounds. The lithic debris and plain pottery were unlike the artifacts commonly found at other large mound sites in the eastern part of the state that belonged to the Mississippian cultural tradition. 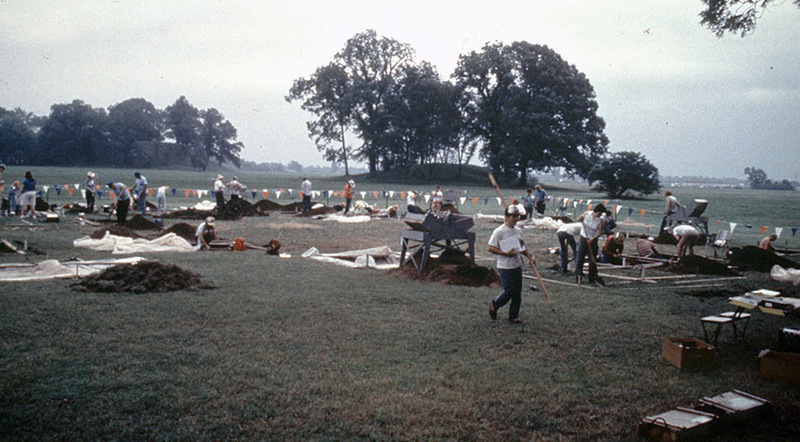 Despite its proximity to roads, rail lines, and Arkansas’s urban center, no investigations of substance took place at the Toltec site until 1966 when the University of Arkansas Museum and the Arkansas Archeological Society undertook a 9-day field project to collect artifacts and test one of the mounds. By that time, the site had been in cultivation for decades, and only the three largest mounds and parts of the embankment were still prominent landscape features. The test indicated that the smallest of the three main mounds was likely to be a burial mound, and the artifacts indicated that the site was associated with the Woodland period Coles Creek culture. Arkansas acquired the Toltec site in 1975 and added it to the state’s Parks system. A partnership was formed between Arkansas Parks and Tourism and the Arkansas Archeological Survey that put a Research Station at the Park and tasked the Survey with planning and carrying out research that would reveal the age and purpose of the grand site, and tell the story of the people who built and used it. Dr. Martha Rolingson became the Toltec Station Archeologist and she directed fieldwork, wrote reports of the discoveries, and helped develop exhibits and interpretive programs for 30 years until her retirement. The Survey continues its partnership with State Parks undertaking new fieldwork, creating the State’s first Native garden exhibit, and planning future research today. 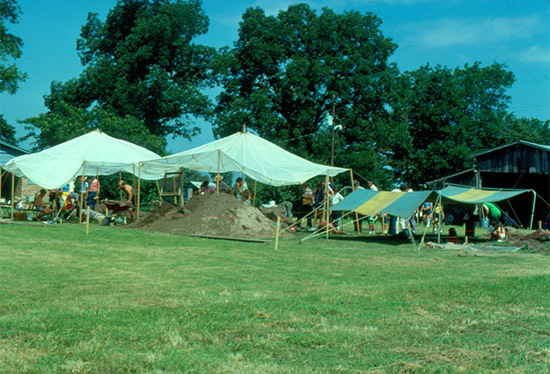 The 1977 University of Arkansas field school was held at Toltec Mounds. In 1976 Rolingson developed a strategic research plan for the Toltec site that is still guiding efforts. 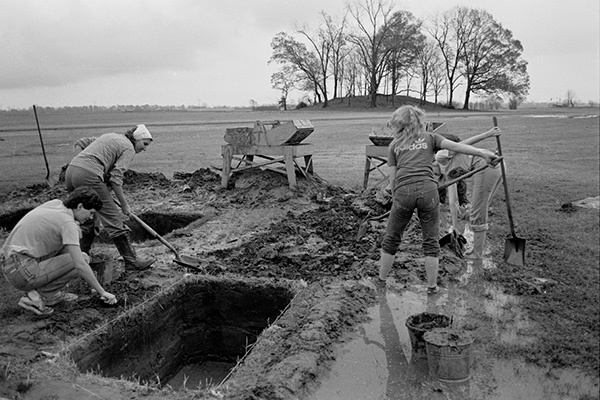 With Arkansas State Parks participation, University of Arkansas archeological field school support, National Park Service and Arkansas Historic Preservation grants, Arkansas Archeological Society volunteers, and Survey funding, Rolingson conducted six seasons of fieldwork between 1977 and 1983. Workers mapped the site, carried out formal surface collections, tested the plaza area between the largest mounds, cross sectioned the embankment, and carried out large-scale excavations of Mound D. This work confirmed the Woodland period origins of the site, provided an estimate of the late period of occupation around AD 1000, showed that some of the mounds were used as public platforms for feasting, ceremonies, and other activities, and confirmed that the large open space adjoining the largest mounds was an open public gathering space and not a village. The artifact collections provided material for graduate student theses, special analytical studies, and information that was used for published monographs, research presentations, public exhibits and activities, and the ongoing interpretive Park activities. A second round of excavations between 1988 and 1990 at Mound S, another of the smaller mounds, provided information about the earlier period of Toltec’s existence between AD 750 and 800, and increased information about the activities that went on at the site and the relationship of the inhabitants to the natural resources and social groups elsewhere in eastern Arkansas. A sixth excavation project and Survey-Society Training Program took place in 2010 in a location adjoining Rolingson’s first work in 1977. Not yet fully studied, the fieldwork demonstrated that the site has many surprising things to reveal despite four decades of research; a group of sturdy buildings once stood near Mound D, their age and purpose still unknown. Mound D excavations during the 2010 Arkansas Archeological Society Training Program. Mound B is in the background. Three book length monographs and visitor center exhibits lay out much of what has been learned about the Toltec Site since 1975. Native residents of east Arkansas began constructing the first of the mounds around AD 650, and the site was the focus of activity until about AD 1050. At its height, Toltec was one of the biggest and most complex political and religious centers in the Mississippi River Valley. It was not a town or village, but rather a gathering spot for people living in small settlements within a 50-mile radius who undertook mound and embankment construction projects over many generations, and who gathered periodically to witness and participate in public feasts and rituals. Only a few key leaders or caretakers remained at the site between celebration periods. The lifestyle that gave rise to Toltec and satellite communities is now called the Plum Bayou Culture, a regionally distinctive version of the greater Coles Creek culture found up and down the Mississippi Valley. People resided in settlements of different sizes where they used wild plant and animal resources, and gardened a variety of wild and domestic native annual plants. Bows and arrows were standard hunting implements. Work and trading parties had contacts far from Toltec and secured a wide variety of materials, such as crystals, igneous rocks, and chippable novaculite from the Ouachita Mountains that have been found at the site. Social and religious leaders had long-distance and intense relationships with people at faraway centers that were also on the rise, most notably the Spiro site and its neighbors in the Arkansas River valley in present day Oklahoma, and the Crenshaw site and its neighbors in the Great Bend of Red River in the vicinity of present day Texarkana. The Toltec site and Plum Bayou culture went into decline after AD 1000, at the same time that the new Mississippian lifeway was developing in the Mississippi Valley and elsewhere in the Southeast. 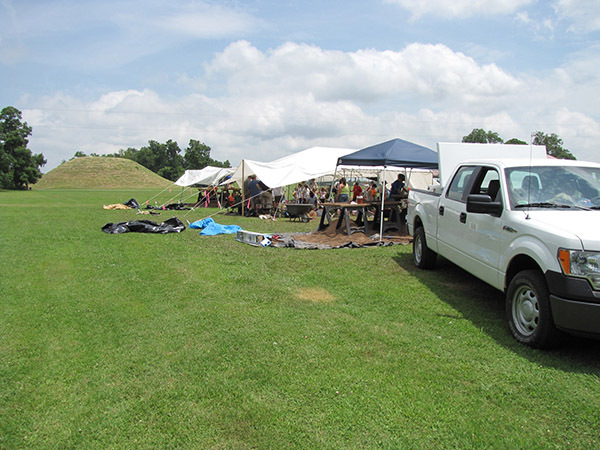 What relationship may have existed between these two historical events is still unknown, but future research built on the Arkansas Archeological Survey and Arkansas State Parks partnerships at the Toltec Archeological State Park may figure importantly in these and other future investigations.